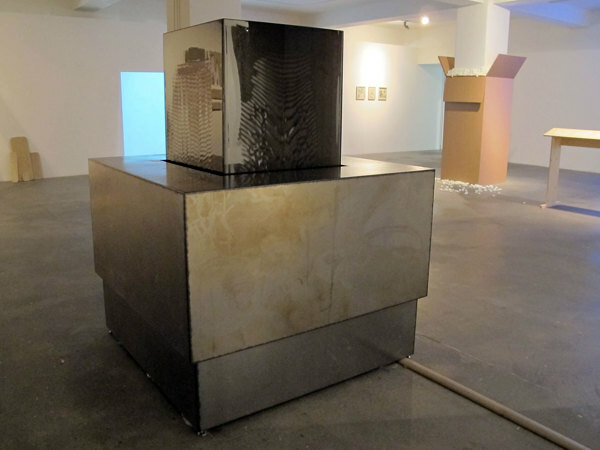 The piece consist of one box 68x68cm in diameter, perched on top of the second box wich is 136x136cm in diameter. Finally there is a base wich is 3,4 cm smaller than the large box. The diameters are derived from Dürers Magic Square that appear in the engraving Melancholia I. The small box on top is covered with a slow flow of black oil. Sound of falling droplets and a silent hum of a machine make up the soundscape. The name is a referance to humorism, wich is an anchient theory about the makeup and workings of the body. According to humorism our body is made up of four fluids wich are sanguin(blood), phlegm(water), yellow bile and black bile and the unbalance of these fluids are the main cause of illness. Excess of black bile in the body is the main cause of Melancholia(depression). I have created the theory of social humorism where the bodily fluids become ‘social fluids’. In social humorism blood translates to human beings, water in the body becomes water on earth, yellow bile is maissyrup and black bile is petroleum oil. Therefore our society wich runs on petroleum is a melancholic one according to the theory of social humorism. Oil is a driving force in our society, our society runs on consumerism and everything we consume has been made with oil somewhere in the production line, be it with transportation, packaging or production itself. Black Bile is a monument of this. It is a monument of a melancholic society addicted to oil. It has hopes for improvement but remembers the past, what has been lost and what has been gained. To know what could be lost we must not forget the things that we have lost already.